The Mall Galleries were packed with people this afternoon when I arrived to review the Annual Exhibition of the Royal Institute of Painters in Watercolour. This exhibition has always been very popular with the provincial art societies whose members arrive in droves - on coaches! I gather the exhibition has been busy all week. I very much recommend a visit to anybody interested in watercolour painting. The exhibition continues until next Thursday 18 April 2013 ( 10am to 5pm) and this upcoming Saturday promises to be very busy with artists in the gallery and a brushmaker demonstrating his craft! 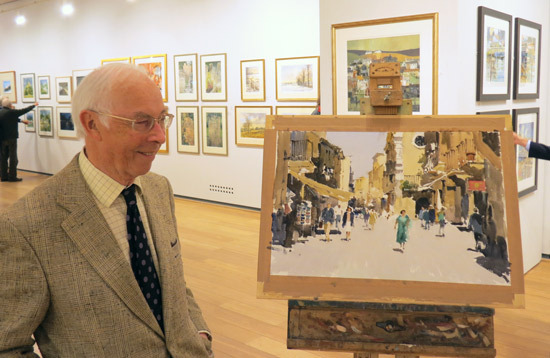 Below is a photograph of John Yardley RI who was a very popular demonstrator today. John has been painting full time as a professional artist since 1986 and was elected to the RI in 1990. 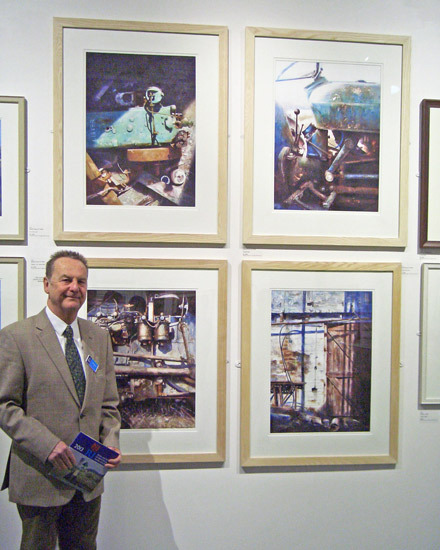 You can see his work in quite a few galleries besides the Mall Galleries - but you can also some of his work below. The exhibition is large and full of paintings of great quality. 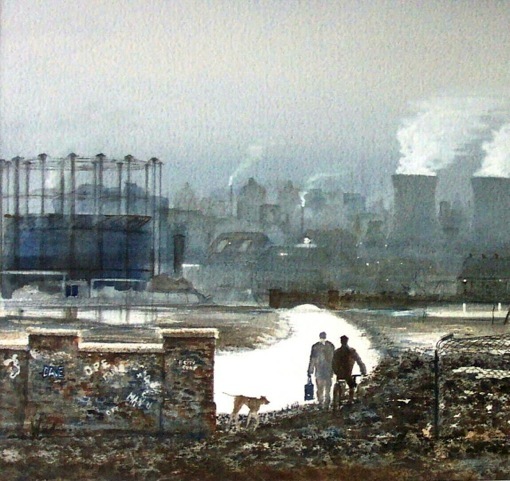 I always associate the RI with being the society which does "proper watercolour" ever since the RWS started showing rather more works in acrylic. 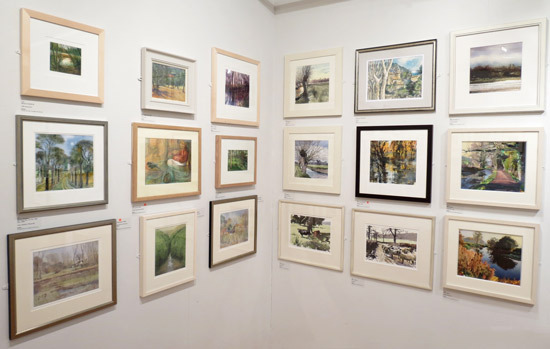 However this year the RWS Spring Exhibition surprised me by a very clear emphasis on watercolour - and the RI surprised me yesterday with more works in acrylic than I'm used to seeing. Apparently I wasn't the only person who made this comment. For me, acrylic is fine in a watercolour exhibition - so long as all the work is on paper and the acrylic is used as per watercolour and gouache ie no impasto elements. Some were very impressive. While I thought a few which I thought were getting a bit close to the edge on that definition. That said I saw much more evidence of all the different ways you can work with watercolour in this exhibition than I did at the RWS (Leslie Worth excepted). Below you can find some more pictures of the exhibition, followed by a list of the prizewinners and details of further events. as part of the Awardwinners exhibition - if relevant. This means you can now see all the works on display and buy them even if you can't visit the exhibition! However the exhibition does not stay online permanently so if you're interested you need to act during the course of the exhibition. I managed to leave my catalogue behind when paying for a new book by David Curtis. The following listing is not bad for somebody who's managed to leave her catalogue with all the details of prizewinners and notes in the gallery! These demonstrate an amazing understanding of how you can work with watercolour to create different effects. The granulating paints and the mastery of atmosphere and coastline is just stunning and contemporary watercolour painting at its very best. I'm not in the least bit surprised she won the Turner Award this year - nor that all four paintings have sold very quickly. I would imagine they were snapped up! Click the link in her name to see more work on her website (the same applies to all artists - websites are linked to names). 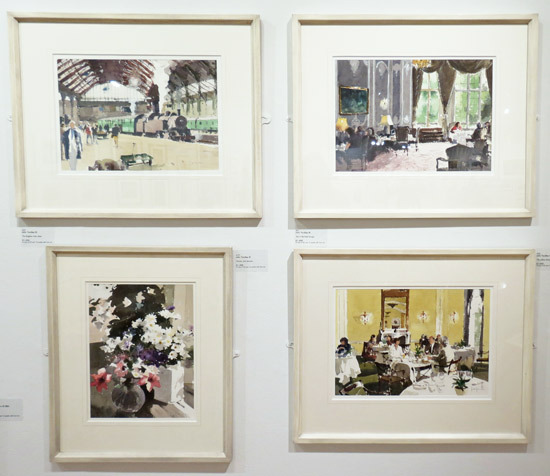 These are also paintings which demonstrate what can be achieved with watercolour and are expertly painted. I'm not in the least bit surprised that they won the Winsor & Newton prize. I expect he'll be a candidate for the Turner Award in the near future. The Anthony J Lester Art Critic Award Presented by Anthony J Lester, an award for the best quality and most interesting work in the show. I had a very close look at this one to try and work out whether there was an element of collage. The heads are all very finely drawn in comparison to the rest of the bodies - which are very characteristic of his work. I'm tempted to say there's something of a colour field approach going on in this painting. The Neil Meacher Sketching Prize An award to go to the member whose submitted sketch book is judged to be the best in the exhibition. I'm so pleased that this society gives a lot of prominence to the keeping of proper sketchbooks. A number are on display within the exhibition. I desperately wanted to turn the pages in Colin's sketchbook (it's in the far north gallery - under the window). 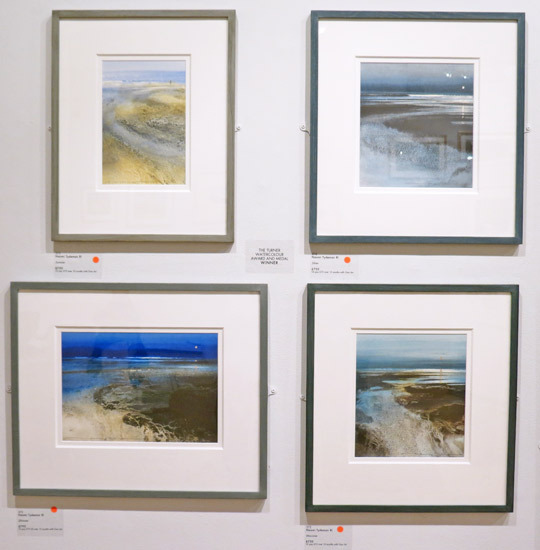 I think we need to persuade the Mall Galleries to invest in iPads embedded in the walls - turning the digitised images of the pages of award-winning sketchbooks! They were a huge success in the Hockney exhibition and I'm sure will become one of the key ways of exhibiting art such as sketchbooks in the future. The Debra Manifold Memorial Award Presented by the Linda Blackstone Gallery, an award for an outstanding watercolour. The Rowland Hilder Award Presented by the Lincoln Joyce Gallery. 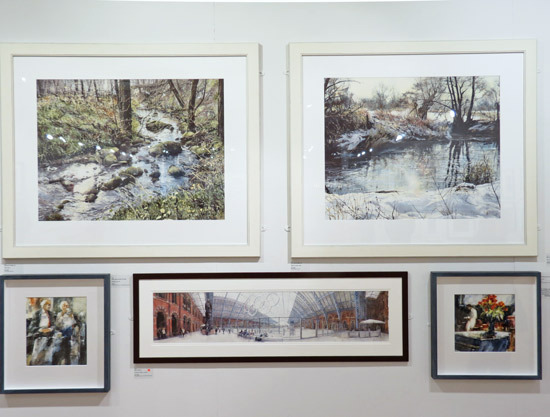 An award of £250 for an outstanding traditional watercolour. 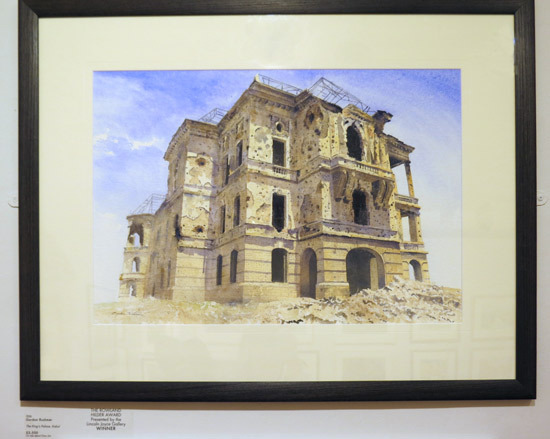 Gordon is a war artist and in recent years he has worked in areas of conflict as diverse as Bosnia, Kosovo, Eritrea, Ethiopia, Afghanistan and Iraq. This is a painting of conflict by am artist who has been on the spot. It's good to see war artists getting the recognition they deserve. 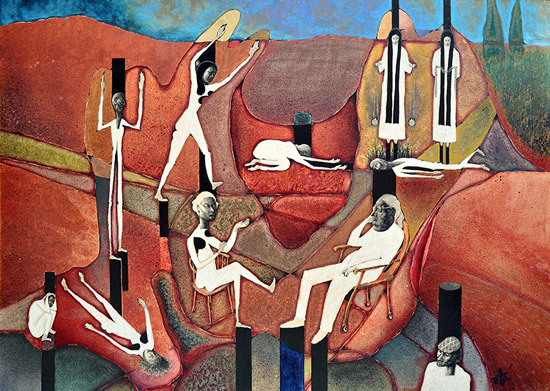 The Donald Blake Award Presented by the Lincoln Joyce Gallery. An award of £250 for an outstanding innovative watercolour. This one made the most of being almost monochromatic. I love the silhouettes - sometime the simplest things work best. The Frank Herring Easel Award An easel presented for an outstanding work in the exhibition by Frank Herring & Sons. 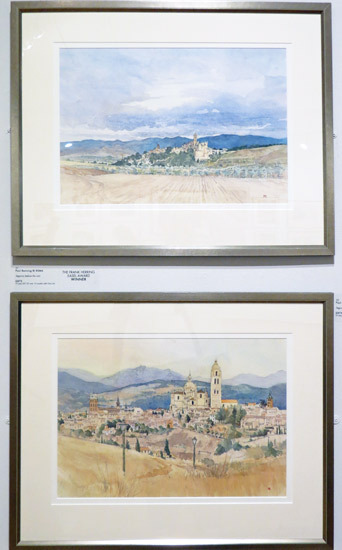 You can see Paul's sketch for Segovia before the rain in his sketchbook which is on display on the North Gallery and compare the painting done on the spot with the one worked up from his reference material when back in the studio. 2.30pm : the renowned Spanish brush maker Escoda will be in the gallery demonstrating the fine art of making handmade brushes. 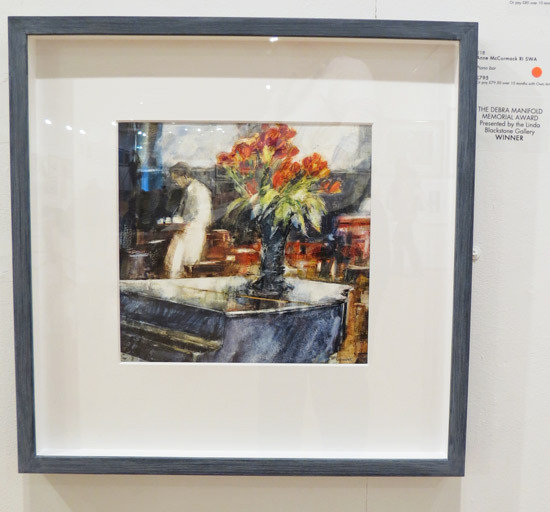 Thankyou Katherine Tyrell at Making a Mark for the very positive review of the 201st R.I. Exhibition at the Mall Gallery. 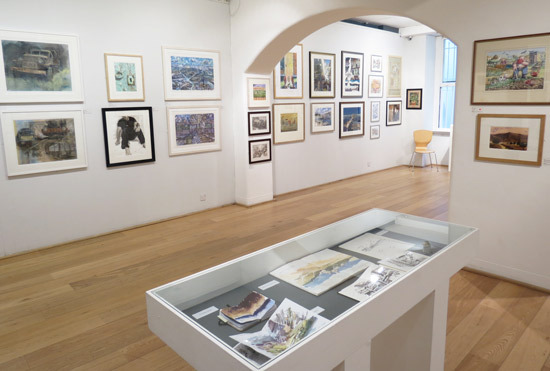 It is uplifting to be exhibiting with such a collection of astounding contemporary watercolour painters, congratulations to all artists included in the show.Painting is alive and kicking at the Mall Gallery London !